Researchers at the University of North Carolina at Asheville are working with the U.S. 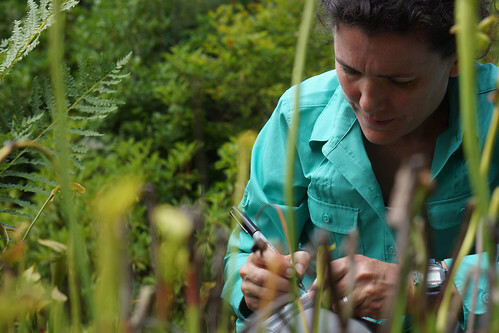 Fish & Wildlife Service to learn more about rare pitcher plants. Pitcher plants have a modified leaf in the shape of a pitcher. The pitcher is lined with tiny, downward-facing hairs. In many pitcher plants, an insect is attracted to the pitcher's scent, begins climbing down, and the hairs prevent it from reversing course, leaving its only option to go deeper, until it comes to the pool of enzymes, is digested, and feeds the plant. However, in other pitcher plants, the plants get others to do much of this work. In the purple pitcher plant, which is found in western North Carolina, the pool of water at the base of the pitcher is home to a community of life, with 165 species found living within its pitchers. In these cases, it's this community of life that does the digesting, and the plant absorbs nutrients released as these other species feed and grow. The purple pitcher plant hybridizes with the endangered mountain sweet pitcher plant, which uses enzymes to digest insects. Two different pitcher plants. Two different feeding strategies. What happens in their offspring? That's one of the questions the researchers hope to answer. By periodically collecting and examining water from the pitchers, they'll gain an understanding of how both communities of life and enzyme solutions vary among the purple, mountain sweet, and hybrid pitcher plants.